Late last month, TAG welcomed the announcement by ABC, a leading UK digital verification expert, that it will offer services as an outside auditor for TAG’s Certified Against Fraud, Certified Against Piracy, and Certified Against Malware Programs. ABC becomes the independent verification provider for TAG’s seal programs focused on a non-US market, joining the Alliance for Audited Media, BPA Worldwide and Ernst & Young in providing auditing services for TAG’s certifications. As the network of external auditors supporting TAG certification has grown, so have the number of companies taking advantage of those services. To date, 26 companies have chosen to be independently validated for one or more of TAG’s certification programs, earning a total of 41 independently validated certification seals, accounting for 27% of all TAG certification seals awarded to date. Eight companies have been validated for more than one of TAG’s seal programs, while three companies (LKQD, OpenX, and Sovrn) have earned all four TAG certification seals through independent validation. Notably, as TAG expands its global reach and impact, every company that has chosen to be independently validated has also opted to certify its global operations, showing the importance of independently validation in non-US markets – particularly in Europe. 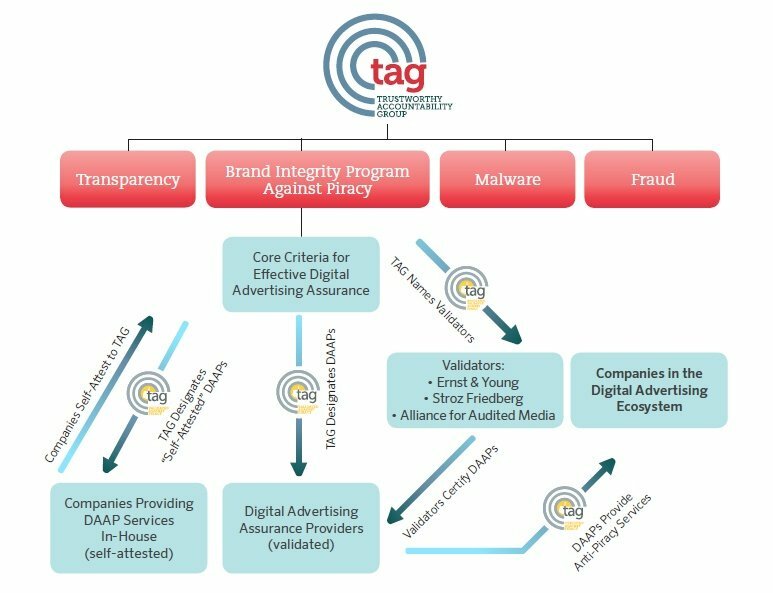 At the core of TAG’s mission is fighting criminal activity in digital advertising, and as the advertising industry’s first and only Information Sharing and Analysis Organization(ISAO), we’ve always engaged in close collaboration with law enforcement to share information about criminal activity and help bring those criminals to justice. Over the summer, TAG has expanded those collaborative efforts through a variety of channels. Just this week, TAG joined the Department of Homeland Security’s (DHS) Cyber Information Sharing and Collaboration Program (CISCP), so we can provide DHS officials with industry intelligence and expertise. Earlier this month, TAG executives also briefed the State Department’s Office of Intellectual Property Enforcement on TAG’s Certified Against Piracy Program, including the success of that programin reducing ad-supported piracy. We’ll continue to share information between our teams in the coming months, particularly when the opportunity arises to collaborate on international IP threats that touch the digital advertising industry. Looking ahead, TAG executives will be taking a visible role at the 2018 International Information Sharing Conference in Washington, DC this October, so we can share the benefits of our experience with other organizational leaders from around the world. We will also be participating in DHS’s 2018 IPR Symposium to help law enforcement agencies understand the nuances of tackling intellectual property theft in the social media environment. In an interview with FIPP, the network for global media, Nick Stringer, TAG’s Vice President for Global Engagement and Operations, offered his insights into the progress being made in fighting digital ad crime and related issues. Excerpts from that interview follow. Established in the US in 2014, the TAG programme has become increasingly successful in reducing fraudulent invalid traffic in the digital advertising supply chain over the years. A 2017 US study carried out by The 614 Group, found that the use of TAG Certified distribution channels for digital advertising reduced the level of fraud to 1.48 pere cent - an 83 per cent reduction over industry averages. The programme is supported by the World Federation of Advertisers (WFA) in its recent Global Media Charter. In an industry where the benefits of increased co-operation amongst practitioners have long since been emphasised by FIPP and others, TAG offers a co-ordinated approach. It is working towards a harmonised approach across markets. But the growing prominence of digital advertising brings with it a whole new set of challenges, not least in the form of harmful malware software. Brand safety soared to the top of the digital advertising agenda throughout 2017, with an end-of-year survey from the Association of National Advertisers revealing almost four-fifths (78%) of its members had concerns about brand safety issues in programmatic. By working with exchanges that are audited by independent industry associations, such as TAG, JICWEBS and the IAB Gold Standard, buyers can have confidence in the quality and suitability of the supply on offer. To curate a clean, high-quality media ecosystem exchanges need to implement a rigorous vetting process, ensuring only domains with appropriate, brand safe content are included. Rather than a one-time check, this process should involve detailed audits and ongoing monitoring, using a combination of human review and intelligent technology to maintain the integrity of the network.